Fearful of getting robbed overseas, or wish to avoid overseas theft? Or maybe the idea of avoiding overseas theft has never even crossed your mind. 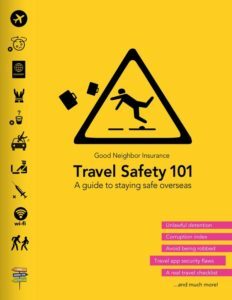 It’s good to be aware (and concerned) of it, but even more, every traveler should have some specific plans to avoid becoming a victim! Want to avoid overseas theft? Don’t rely solely on your phone for information such as emergency numbers, flight details, or insurance policy numbers, especially if you’re traveling somewhere with unreliable electricity/internet service. Your phone battery may die, or you might drop it and not be able to recover the information! Try to have a physical backup of anything important you need, and keep it somewhere safe. You can also make copies of important documents such as your passport or visa, and keep the originals in a secure place. To avoid overseas theft, try to keep your bags closed and locked up when you travel. Locking your bags’ zippers with anything from a paper clip to an actual lock can help immensely, although if you have to leave your bag somewhere, please note that zippers aren’t always secure, even if lockable. They can be broken into with something as simple as a ballpoint pen, and re-zipped (if your bag has dual zipper pulls) without you ever knowing anyone was in your bag. Youtube has plenty of examples of this exact thing! If you ever need to set your bag down, such as when traveling on public transport, do so with one foot through the strap. This will dissuade people that are behind or to the side of you from sneaking off with it. Especially if you’re a woman, avoid single-strap shoulder bags. It’s extremely easy for someone to slash the strap and take off with your bag. These may seem like simple tricks, but they will deter pickpockets and cause them to search for an easier target. Be careful when going out, and especially avoid going out alone. Avoid standing out and drawing attention to yourself, either through plainly foreign or touristy clothing, or expensive bags/devices/etc that might make it harder to avoid overseas theft. Especially if going out alone, you should always tell someone where you’re going before you leave, as well as how you’re going to get there and when you’ll be checking in with them again. Make sure you know a few phrases in the local language, including “HELP” so that others will be able to assist you with simple needs like directions if lost, or in the case of an emergency. The free guide: The Definite Guide to Jet Lag. And don’t forget good travel insurance! For only about $1.00 a day it protects you from emergencies but also includes some protection in case of theft or lost bags.